Today’s Daily Deal is for a case of 20 Scott Kitchen Roll Paper Towels. 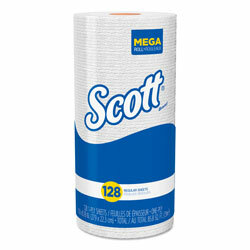 Scott is a trusted brand from parent company Kimberly-Clark, one of America’s top consumer goods manufacturers. This paper towel roll is designed with absorbency pockets that make the most performance out of each single-ply sheet. There are 128 large 11″ x 8.78″ perforated sheets per roll at a temporary sale price of only $1.69 per roll. The standard size cardboard tubing makes this roll compatible with most household paper towel dispensers and holders, letting you tear off a sheet with one hand. These bulk paper towels are designed to clean up tough jobs in the kitchen without tearing. You can save money by buying all your disposable goods in bulk, and today this bulk case of paper towels is on sale, so visit ReStockIt.com’s Daily Deal page to cash in on this great offer! On a similar note,, This article is dedicated to provide information and my perspective on the Vemma business opportunity and to offer insight on the products, compensation plan, and some exciting training techniques that are necessary to be successful in Vemma or any other home based business. penny stock In my opinion animating will certainly eliminate this idea. The photos demand person to visualise what’s going on that that visualizing is exactly what brings about your laughter. It’s as being a complex, intricate joke in case you clarify this, as an alternative to permitting your current viewers “have itInch, this damages your laughter. Every person’s an art form movie director.